7 Amp 1 STEP - Ford Clev. & 385 BB, Carby, N.A. Or BUY NOW with 4 interest-free fortnightly payments of $316.25 . 7 AMP 1 STEP Kit - Ford Cleveland & Big Block 385 V8, carburettor, N.A. This ICE Ignition kit is for the Ford Cleveland V8 including the Big Block 385 engines running a carburettor with no forced induction or nitrous. This kit is ideal for most street and race cars and can also be used with electronic carburettors that control "Air and Fuel" only. The ICE Ignition "Digital Inductive Spark" technology delivers the most powerful spark and longest duration of any ignition system on the market. More spark means greater tuneability which ultimately leads to improved performance. 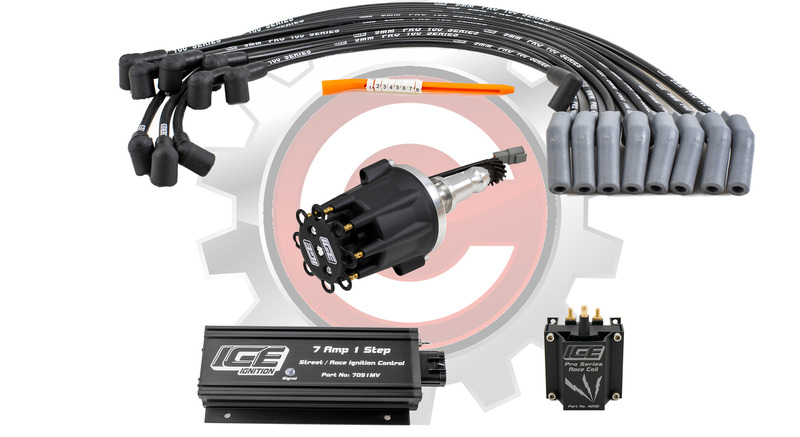 At the heart of this kit is the ICE Ignition 7051MV Street / Race Series Ignition Control Box. This controller has the following features. 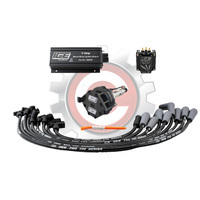 16 Pre-programmed ignition curves - The push-button selectable curves enables total timing adjustment in real-time. 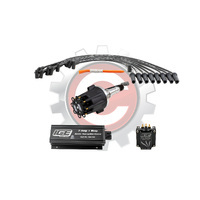 It eliminates the need for distributor re-graphing when engine upgrades are introduced. It allows you to adjust total timing for changes in fuel quality. Vacuum Advance Manifold Absolute Pressure (MAP) Sensor - The MAP sensor detects when your engine is cruising and instantly advances timing to deliver improved fuel efficiency. Use of the MAP sensor is optional, it will not impact on the ignition's ability to deliver the maximum spark. 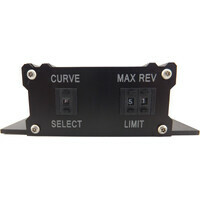 Single Rev Limiter (1 STEP) - A push-button selectable rev limiter that can be adjusted in 100 RPM increments. It provides great insurance against accidentally over revving your engine by cutting out spark at the pre-determined limit. 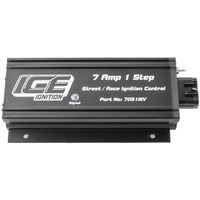 The ICE Ignition controller must be mounted inside your car. It should not be mounted in your engine bay. ICE Ignition strongly recommends the use of NON-RESISTOR Spark Plugs. 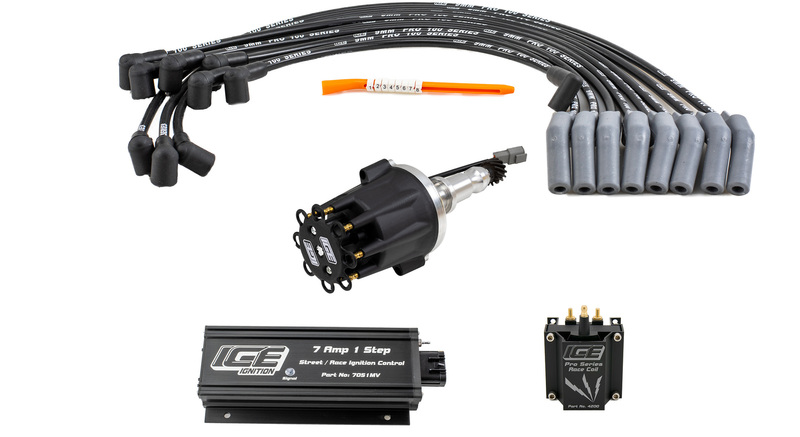 What's in the ICE Ignition Kit? 7051MV Controller - 16 pre-defined push-button selectable timing curves, Manifold Absolute Pressure (MAP) sensor and a push-button selectable rev limiter. Engine Camshaft – The is MOST important, please select the camshaft type from the options list. If you are unsure please call us on 1300 722 580. LARGE or SMALL Cap Distributor - A "No Cost" option of a SMALL (4" diameter) or LARGE (5" diameter) Cap Distributor. We always recommend a LARGE Cap Distributor if you have the available space. It uses a Heavier-Duty Rotor Button and the post spacing is further apart reducing the risk of crossfire. 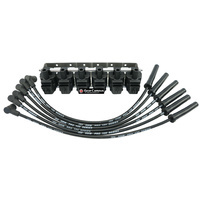 ICE Ignition 9FOR803 Pro 100 9 mm finished lead set - Fitment is AROUND THE VALVE COVERS. If a different lead fitment is required please call us. ICE Ignition 9MMPGU Pro 100 9 mm DIY set - A partially finished lead set with the spark plug end terminated and the boots fitted. The leads are cut extra-long. 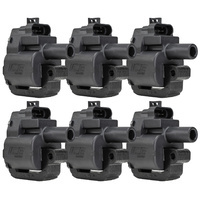 Lead crimpers are required, they are available as an option. ICE Ignition 4200 Pro Series Race Coil - With twice the energy of a standard coil the ICE Ignition 4200 Coil is the ideal coil for naturally aspirated engines. Wiring Loom - The ICE Ignition wiring loom is approximately 2 metres long and is easy to install. The included instructions detail what is required to connect the ICE Ignition system to your car. * You will save money by not having to re-graph your distributor every time you upgrade your engine. 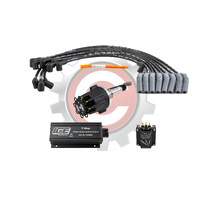 * More spark and duration delivers greater tune-ability leading to improved performance. 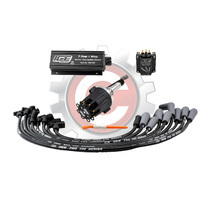 * MAP sensor delivers improved fuel economy under cruising conditions. * Avoid engine pinging scenarios through bad fuel by instantly adjusting your engine's timing. * Rev limiter provides insurance against over-revving saving you thousands of dollars in unwanted engine repairs. We offer a 3 year, non-transferable warranty covering defects in materials and workmanship if properly installed. A 2-year warranty applies where the product is being used primarily in a racing application. If installation instructions have been followed and the product is found to be defective, Gear Campus will replace or arrange for repair if returned along with proof of purchase. This shall constitute the sole remedy of the purchaser and the sole liability of Gear Campus Pty Ltd to the extent permitted by law. The foregoing is exclusive and in lieu of all other warranties or representations whether expressed or implied, including any implied warranty of merchantability or fitness. In no event shall Gear Campus Pty Ltd be liable for special or consequential damages. Products must be returned as originally supplied. Warranty is void if products have been modified or tampered with in any way or installation instructions are not followed. 7 Amp 1 STEP - Ford Windsor 351 V8, Carby, N.A. 7 Amp 2-STEP - Ford Windsor 351 V8, Carby, N.A. 7 Amp Kit - Ford Clev. & 385 BB, Carby, N.A. 7 Amp Kit - Ford Windsor 289 to 302, Carby, N.A. 7 Amp Kit - Ford Windsor 351 V8, Carby, N.A.